The Volga (/ˈvɒlɡə, ˈvoʊlɡə/; Russian: Во́лга, IPA: [ˈvoɫɡə] ( listen); Tatar: İdel, Ätil, İtil; Chuvash: Atăl, Kazakh: Edil) is the longest river in Europe with a catchment area of 1,350,000 square kilometres. It is also Europe’s largest river in terms of discharge and drainage basin. 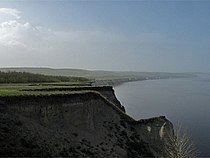 The river flows through central Russia and into the Caspian Sea, and is widely regarded as the national river of Russia. Eleven of the twenty largest cities of Russia, including the capital, Moscow, are located in the Volga’s drainage basin. The Russian hydronym Volga (Волга) derives from Proto-Slavic *vòlga “wetness, moisture”, which is preserved in many Slavic languages, including Ukrainian volóha (воло́га) “moisture”, Russian vlaga (влага) “moisture”, Bulgarian vlaga (влага) “moisture”, Czech vláha “dampness”, Serbian vlaga (влага ) “moisture”, Croatian vlaga “moisture” and Slovene vlaga “moisture” among others. The Slavic name is a loan translation of earlier Scythian Rā (Ῥᾶ) “Volga”, literally “wetness”, cognate with Avestan Raŋhā “mythical stream” (also compare the derivation Sogdian r’k “vein, blood vessel” (*raha-ka), Persian رگ rag “vein”) and Vedic Sanskrit rasā́ (रसा) “dew, liquid, juice; mythical river”. The Scythian name survives in modern Mordvin Rav (Рав) “Volga”. The Turkic peoples living along the river formerly referred to it as Itil or Atil “big river”. In modern Turkic languages, the Volga is known as İdel (Идел) in Tatar, Атăл (Atăl) in Chuvash, Idhel in Bashkir, Edil in Kazakh, and İdil in Turkish. The Turkic peoples associated the Itil’s origin with the Kama. Thus, a left tributary to the Kama was named the Aq Itil “White Itil” which unites with the Kara Itil “Black Itil” at the modern city of Ufa. The name Indyl (Indɨl) is used in Adyge (Cherkess) language. Among Asians,[clarification needed] the river was known by its other Turkic name Sarı-su “yellow water”, but the Oirats also used their own name, Ijil mörön or “adaptation river”. Presently the Mari, another Uralic group, call the river Jul (Юл), meaning “way” in Tatar. Formerly, they called the river Volgydo, a borrowing from Old East Slavic. The Volga is the longest river in Europe, and its catchment area is almost entirely inside Russia, though the longest river in Russia is the Ob–Irtysh river system. It belongs to the closed basin of the Caspian Sea, being the longest river to flow into a closed basin. Rising in the Valdai Hills 225 meters (738 ft) above sea level northwest of Moscow and about 320 kilometers (200 mi) southeast of Saint Petersburg, the Volga heads east past Lake Sterzh, Tver, Dubna, Rybinsk, Yaroslavl, Nizhny Novgorod, and Kazan. From there it turns south, flows past Ulyanovsk, Tolyatti, Samara, Saratov and Volgograd, and discharges into the Caspian Sea below Astrakhan at 28 meters (92 ft) below sea level. At its most strategic point, it bends toward the Don (“the big bend”). Volgograd, formerly Stalingrad, is located there. Subsequently, the river basin played an important role in the movements of peoples from Asia to Europe. A powerful polity of Volga Bulgaria once flourished where the Kama joins the Volga, while Khazaria controlled the lower stretches of the river. Such Volga cities as Atil, Saqsin, or Sarai were among the largest in the medieval world. The river served as an important trade route connecting Scandinavia, Rus’, and Volga Bulgaria with Khazaria and Persia. Khazars were replaced by Kipchaks, Kimeks and Mongols, who founded the Golden Horde in the lower reaches of the Volga. Later their empire divided into the Khanate of Kazan and Khanate of Astrakhan, both of which were conquered by the Russians in the course of the 16th century Russo-Kazan Wars. The Russian people’s deep feeling for the Volga echoes in national culture and literature, starting from the 12th-century Lay of Igor’s Campaign. The Volga Boatman’s Song is one of many songs devoted to the national river of Russia. In modern times, the city on the big bend of the Volga, currently known as Volgograd, witnessed the Battle of Stalingrad, possibly the bloodiest battle in human history, in which the Soviet Union and the German forces were deadlocked in a stalemate battle for access to the river. The Volga was (and still is) a vital transport route between central Russia and the Caspian Sea, which provides access to the oil fields of the Apsheron Peninsula. Hitler planned to use access to the oil fields of Azerbaijan to fuel future German conquests. Apart from that, whoever held both sides of the river could move forces across the river, to defeat the enemy’s fortifications beyond the river. By taking the river, Hitler’s Germany would have been able to move supplies, guns, and men into the northern part of Russia. At the same time, Germany could permanently deny this transport route by the Soviet Union, hampering its access to oil and to supplies via the Persian Corridor. Many different ethnicities lived on the Volga river. Numerous were the Eastern Slavic Vyatchi tribes which took a decisive role in the development of modern Russians. Among the first recorded people along the upper Volga were also the Finno-Ugric people Mari (Мари) and their west ethnic group named Merya (Мäрӹ). The Volga river was also inhabited by the Iranian people of the Sarmatians from 200 BC. In the 8th and 9th centuries colonization also began from Kievan Rus’. Slavs from Kievan Rus’ brought Christianity to the upper Volga, and a portion of non-Slavic local people adopted Christianity and gradually became East Slavs. The remainder of the Mari people migrated to the east far inland. In the course of several centuries the Slavs assimilated the indigenous Finnic populations, such as the Merya and Meshchera peoples. The surviving peoples of Volga Finnic ethnicity include the Maris and Mordvins of the middle Volga. Also Khazar and Bulgar peoples inhabited the upper, middle and lower of the Volga River basin. The Volga, widened for navigation purposes with construction of huge dams during the years of Joseph Stalin‘s industrialization, is of great importance to inland shipping and transport in Russia: all the dams in the river have been equipped with large (double) ship locks, so that vessels of considerable dimensions can travel from the Caspian Sea almost to the upstream end of the river. In the later Soviet era, up to the modern times, grain and oil have been among the largest cargo exports transported on the Volga. Until recently access to the Russian waterways was granted to foreign vessels on a very limited scale. 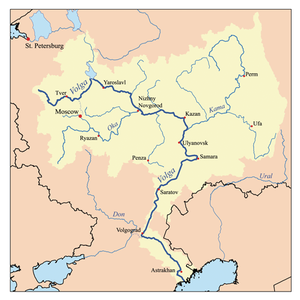 The increasing contacts between the European Union and Russia have led to new policies with regard to the access to the Russian inland waterways. It is expected that vessels of other nations will be allowed on Russian rivers soon. ^ a b c d e f g Scheffel, Richard L.; Wernet, Susan J., eds. (1980). Natural Wonders of the World. United States of America: Reader’s Digest Association, Inc. p. 406. ISBN 0-89577-087-3. ^ See Max Vasmer‘s dictionary under “Волга“. ^ J.P. Mallory & D.Q. Adams, Encyclopedia of Indo-European Culture, s.v. “dew” (London: Fitzroy Dearborn, 1997), 158-9. ^ Michiel de Vaan, Etymological Dictionary of Latin and the Other Italian Languages, s.v. “rōs, rōris” (Leiden: Brill, 2008), 526-7. ^ “Early East Slavic Tribes in Russia”. Study.com. Retrieved 2018-12-16. ^ “Weather Sredniy Buzhan | Forecast, Radar, Lightning & Satellite”. Meteologix – bookmark this page. Retrieved 2018-12-16. ^ “The Volga” (Microsoft FrontPage 12.0). www.volgawriter.com. Retrieved 2010-06-11. ^ “In all, Soviet dams flooded 2,600 villages and 165 cities, almost 78,000 sq. km. – the area of Maryland, Delaware, Massachusetts, and New Jersey combined – including nearly 31,000 sq. km. of agricultural land and 31,000 sq. km. of forestland”. Quoted from: Paul R. Josephson. Industrialized Nature: Brute Force Technology and the Transformation of the Natural World. Island Press, 2002. ISBN 1-55963-777-3. Page 31. ^ “::The Battle of Stalingrad::”. Historylearningsite.co.uk. Retrieved 2010-06-11. ^ “Early East Slavic Tribes in Russia | Study.com”. Study.com. Retrieved 2018-10-13. ^ Bašić, Marko (2015-05-14). “Noble Sarmatian Grave Discovered In Russia”. Slavorum. Retrieved 2019-03-28. ^ “Unique History of Volga River That You Need to Know – Learn Russian Language”. Learn Russian Language. 2018-06-30. Retrieved 2018-10-13. ^ Korotenko, K. A.; Mamedov, R. M.; Mooers, C. N. K. (2000). “Prediction of the Dispersal of Oil Transport in the Caspian Sea Resulting from a Continuous Release”. Spill Science & Technology Bulletin. 6 (5–6): 323. doi:10.1016/S1353-2561(01)00050-0. ^ “NoorderSoft Waterways Database”. Noordersoft.com. Archived from the original on November 9, 2005. Retrieved 2010-06-11.